Stock photo of the lighted skyline at night of Detroit city, Michigan, USA seen from the waterfront in the city of Windsor, Ontario, Canada. Skyline and waterfront scenery at night of Detroit, Michigan from Windsor, Ontario, Canada. 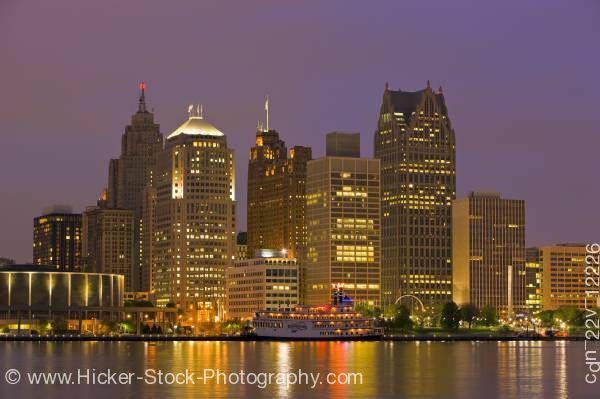 This stock photo shows the skyline of Detroit city, Michigan, USA at dusk seen from the waterfront in the city of Windsor, Ontario, Canada. This beautiful night time skyline scene of Detroit in Michigan, reflects on the water’s surface with glowing colors of yellow, orange, green, and white. The skyline shows different sizes of towering buildings each with its own architectural details. To the left is a round building that stands out on its own with vertical lights spaced evenly around the building. Lights are glowing from the skyscrapers. A ship sits ready for passengers at the shoreline. Along the shoreline there are a scattering of trees. The clear night sky shows a purple hue. Skyline of Detroit city, Michigan, USA at dusk seen from the waterfront in the city of Windsor, Ontario, Canada.